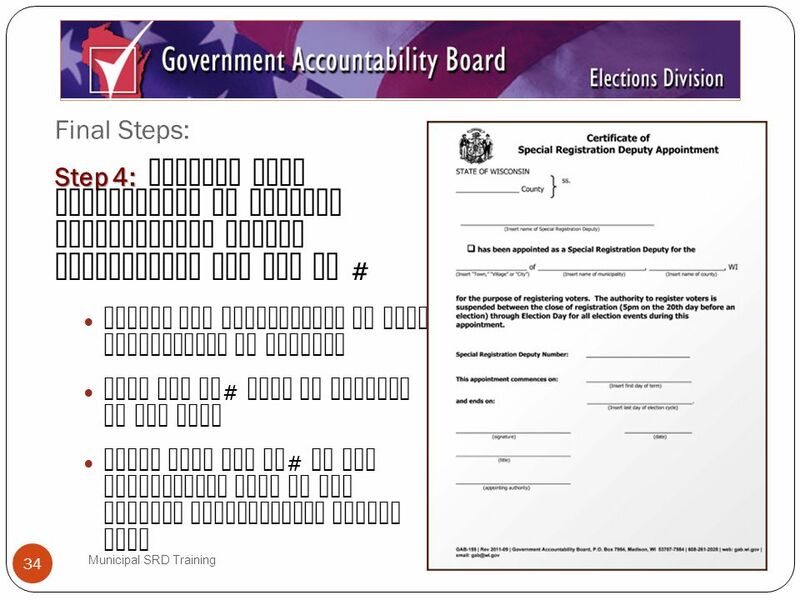 Provided by the Government Accountability Board Elections Division Municipal SRD Training Municipal Special Registration Deputy Training. 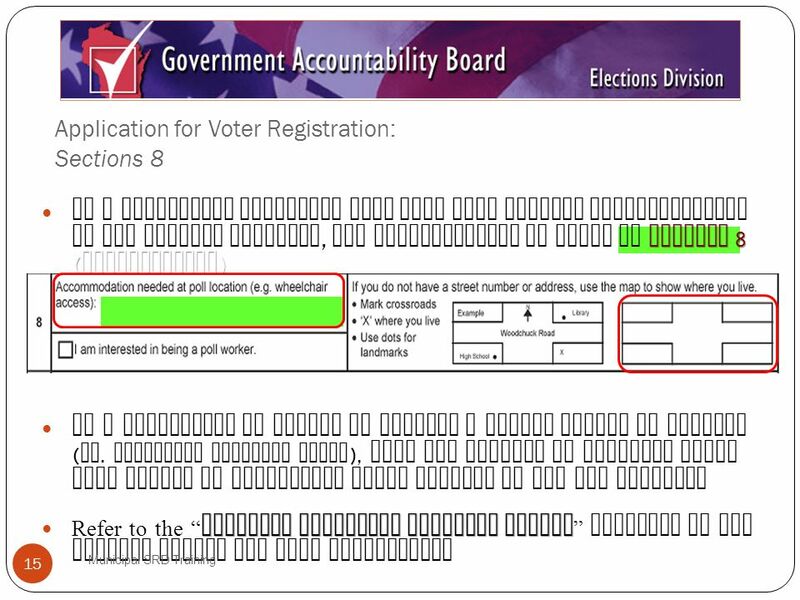 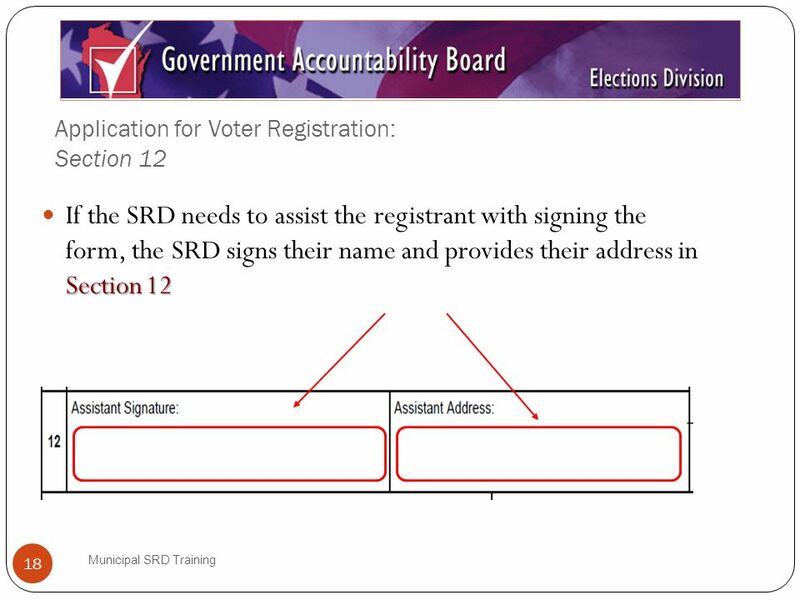 11 Application for Voter Registration: Section 1 Municipal SRD Training 11 Registrant selects reason for filling out the form : New WI Voter, Name Change or WI Address Change ( make sure they live in the municipality for which you have been appointed an SRD ) Registrant indicates what municipality they reside in ( make sure they live in the municipality for which you have been appointed an SRD ) Registrant indicates what county they reside in A B C A. 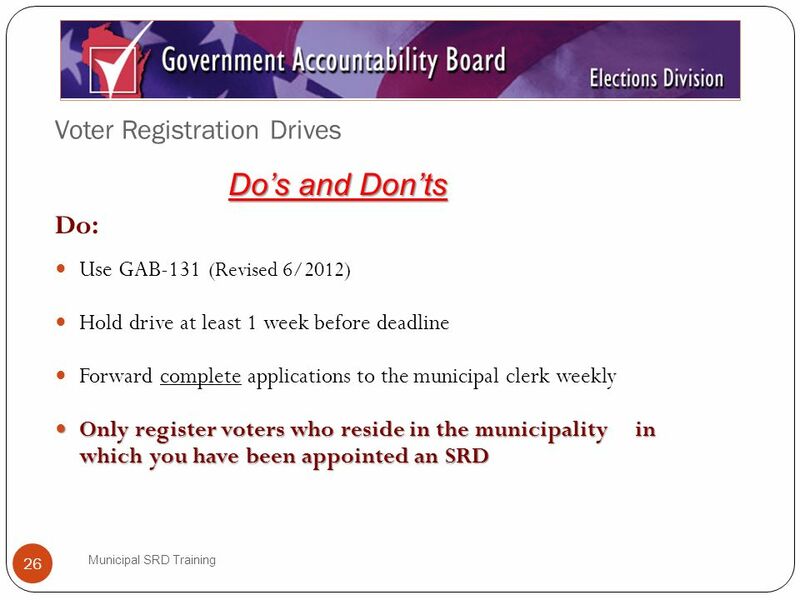 B. C.
16 Application for Voter Registration: Sections 9 and 10 Municipal SRD Training 16 Yes Section 9 Registrants must be able to truthfully answer Yes to both questions in Section 9, or they are not eligible to register to vote Section 10 Registrants must read the certification in Section 10 and sign the application in Section 11 ( next slide )..
19 Application for Voter Registration: SRD Authorization – Bottom of Form Municipal SRD Training 19 sign A. SRD must sign the Application for Voter Registration print B. SRD must print their full name and SRD ID # issued by the municipal clerk A.B. 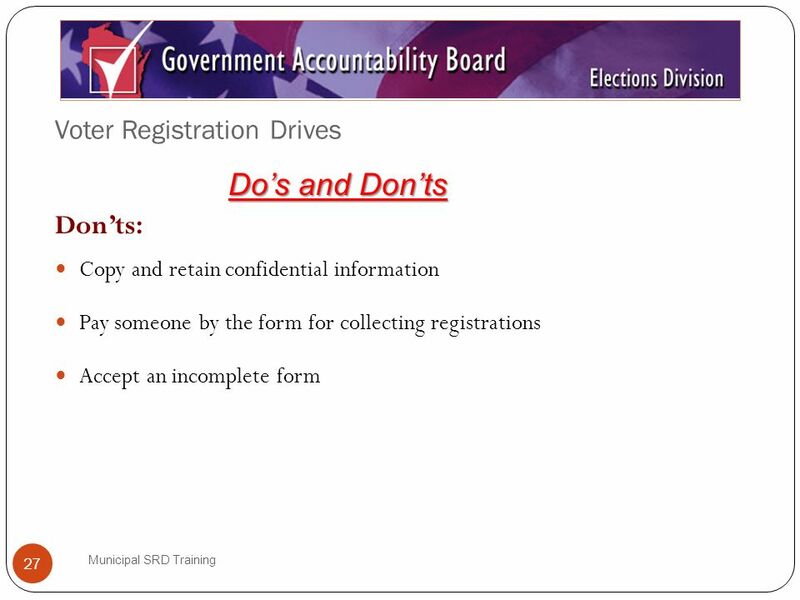 24 Submitting Voter Registrations Municipal SRD Training 24 SRDs should verify that all forms have been properly completed, signed, dated and include the SRD printed name and SRD ID # SRDs have delivered all registrations weekly to the municipal clerk NOT NOT SRDs have NOT delivered registrations after the close of registration as these registrants will NOT appear on the poll book for the next election All registrants must be added to the Statewide Voter Registration System so their names will appear on the poll lists for the next election. 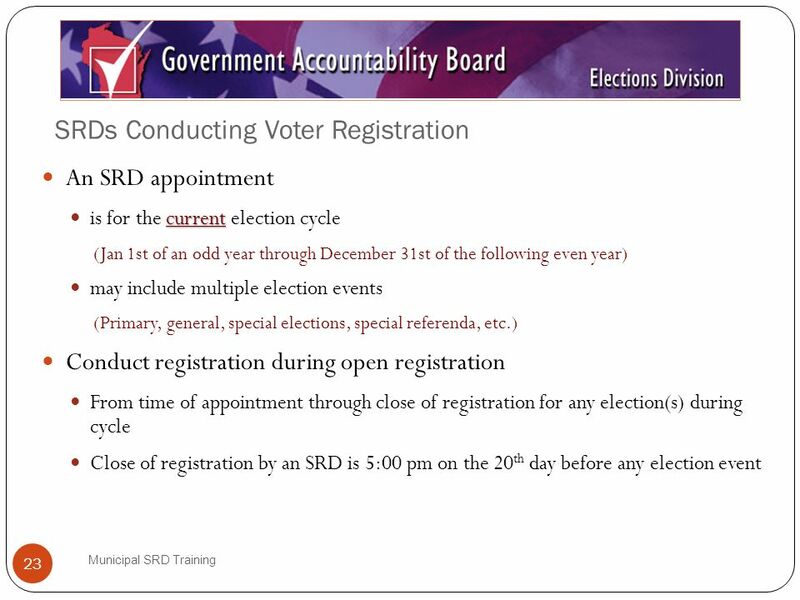 To support the integrity of this process : Failure to adhere to these requirements may result in the revocation of an SRD appointment. 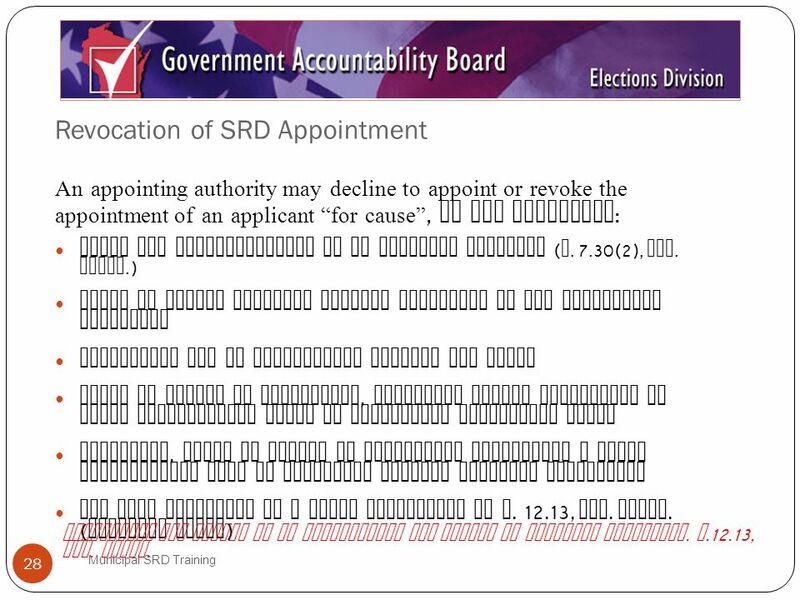 28 Revocation of SRD Appointment Municipal SRD Training 28 An appointing authority may decline to appoint or revoke the appointment of an applicant for cause, if the applicant : Lacks the qualifications of an election official ( S. 7.30(2), Wis. Stats.) 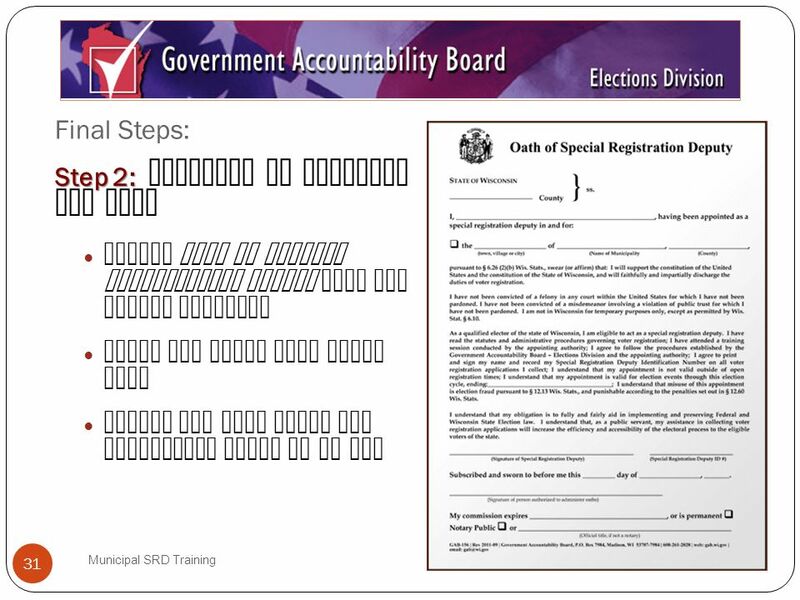 Fails to attend training session scheduled by the appointing authority Previously had an appointment revoked for cause Fails to adhere to procedures, including timely submission of voter registration forms or submitting incomplete forms Falsifies, fails to submit or wrongfully suppresses a voter registration form or otherwise commits official misconduct Has been convicted of a crime delineated in s. 12.13, Wis. Stats. 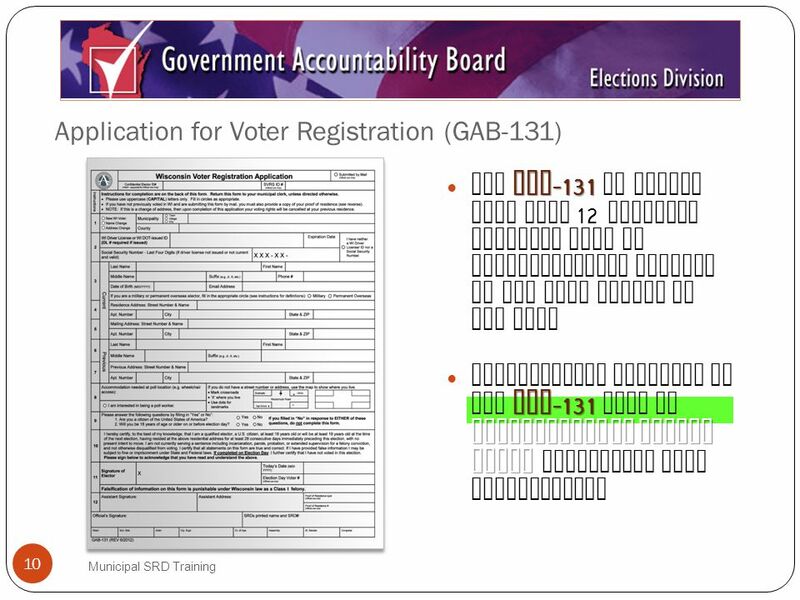 ( election fraud ) Violations for misuse of an appointment may result in criminal sanctions. 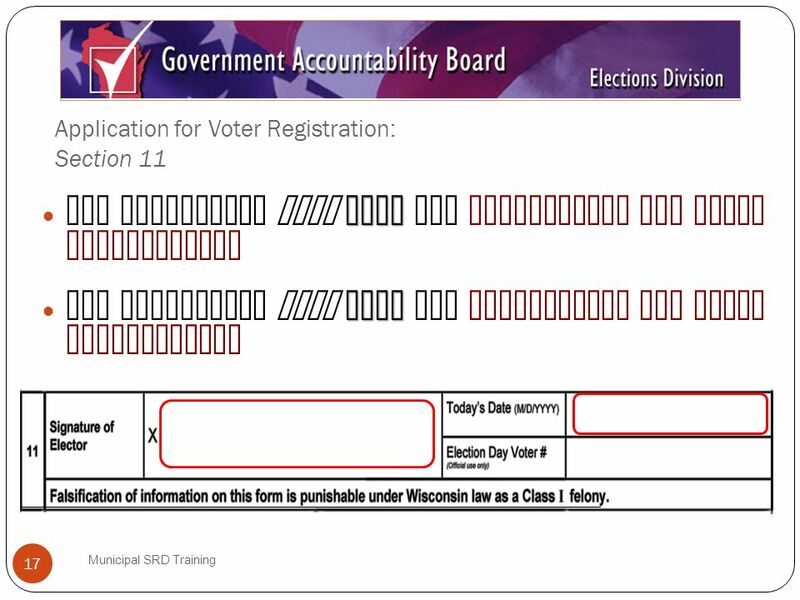 s.12.13, Wis. Stats. 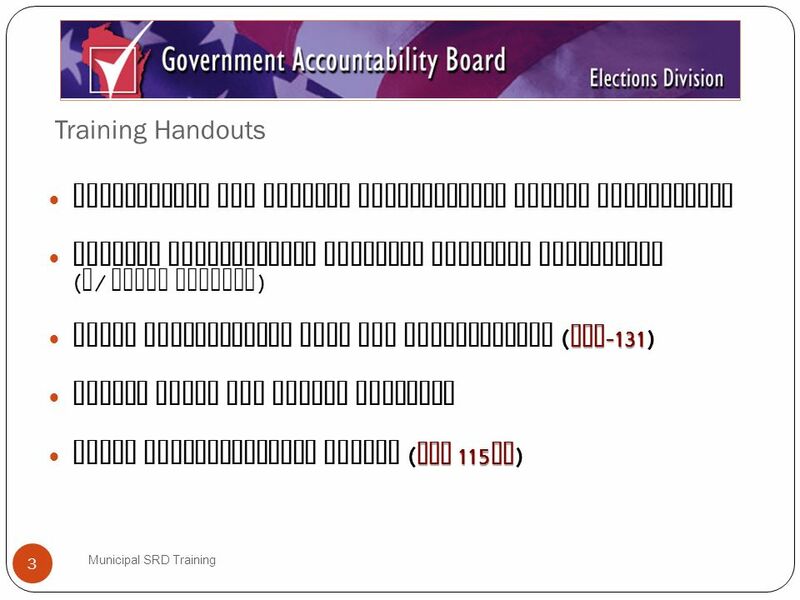 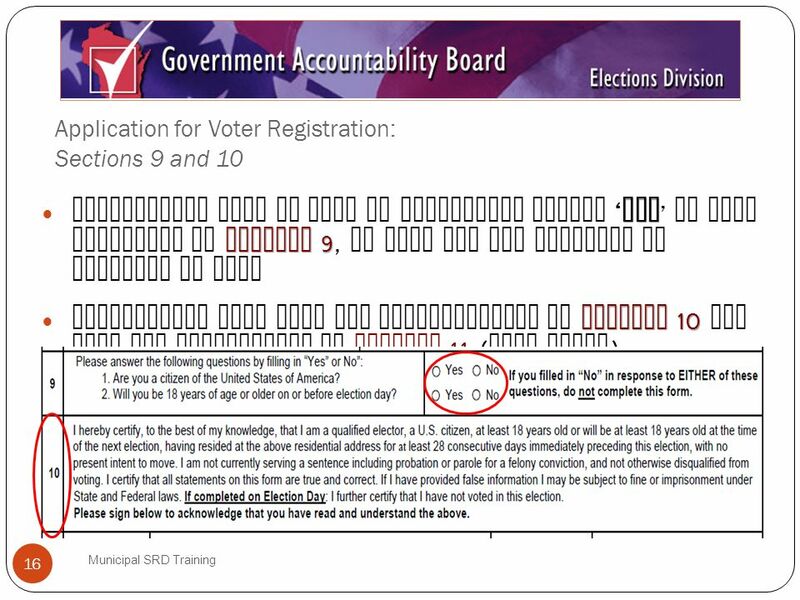 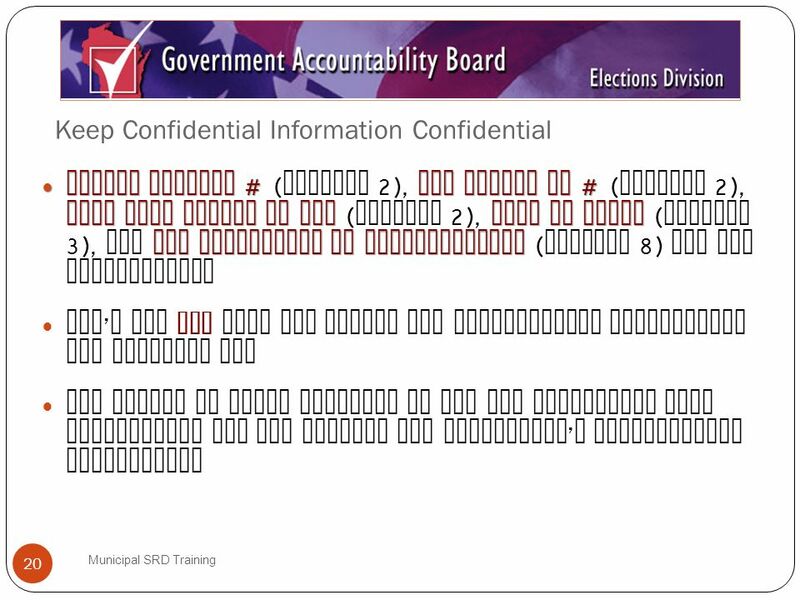 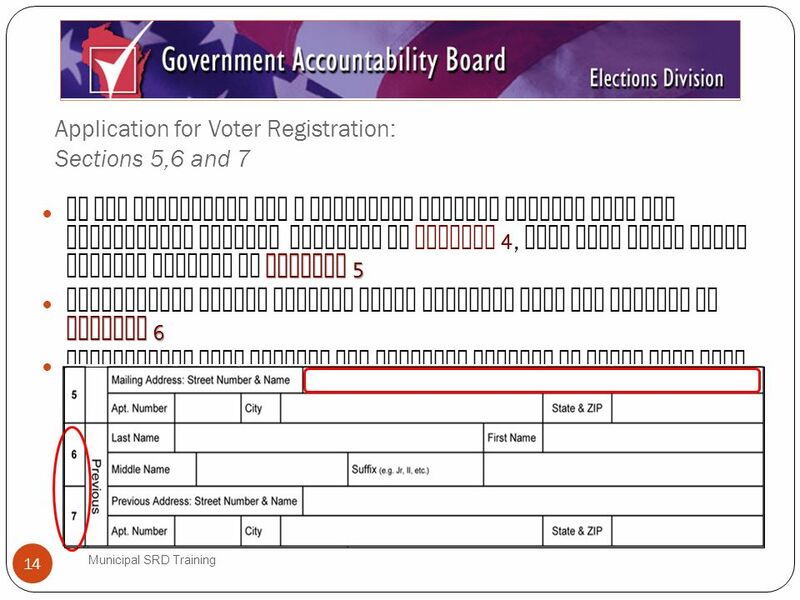 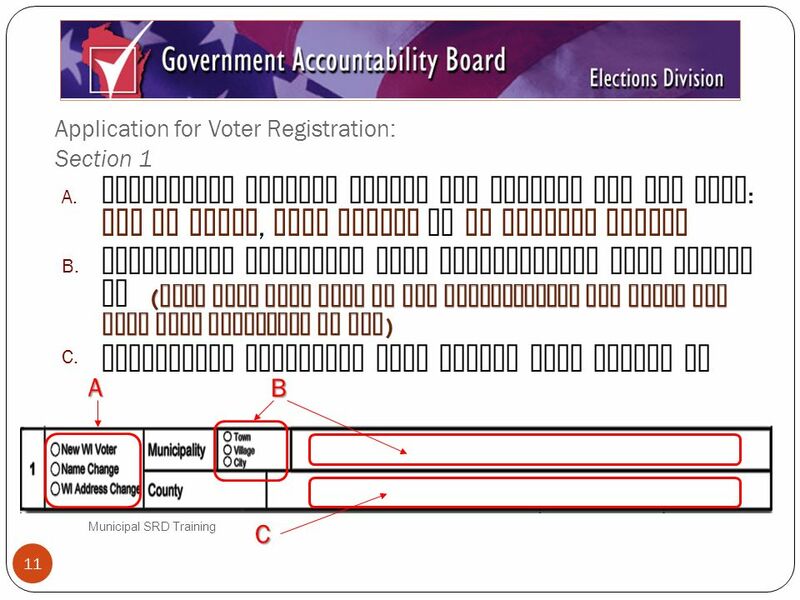 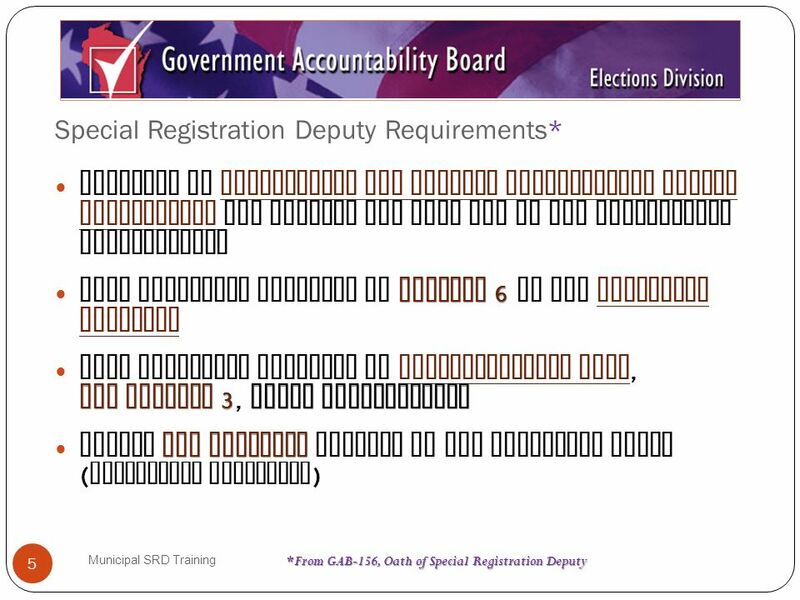 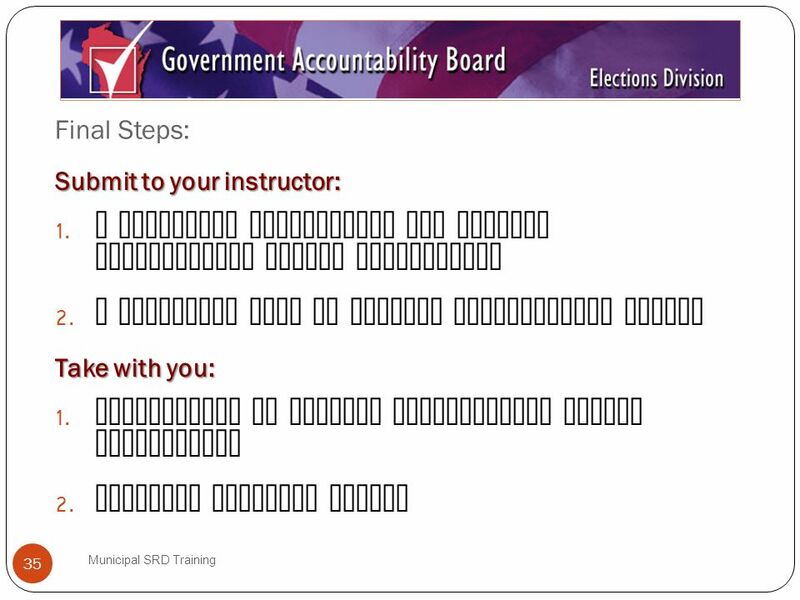 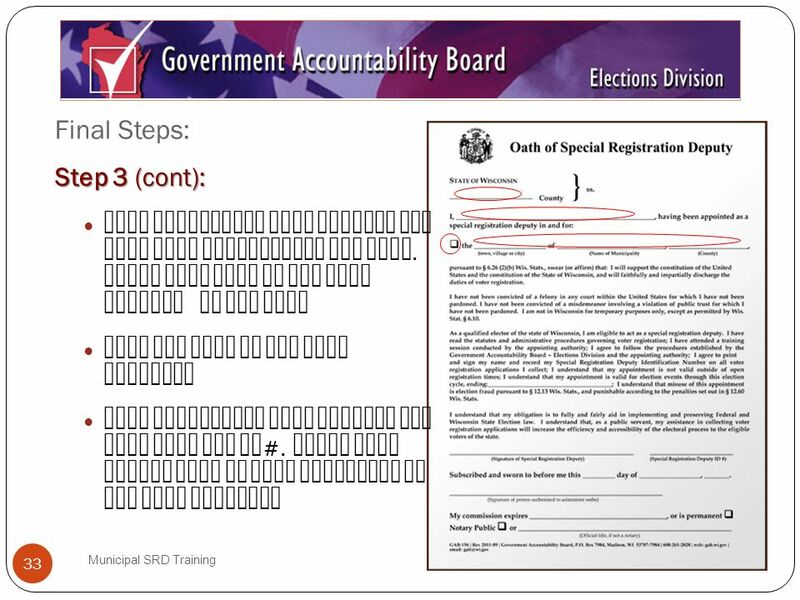 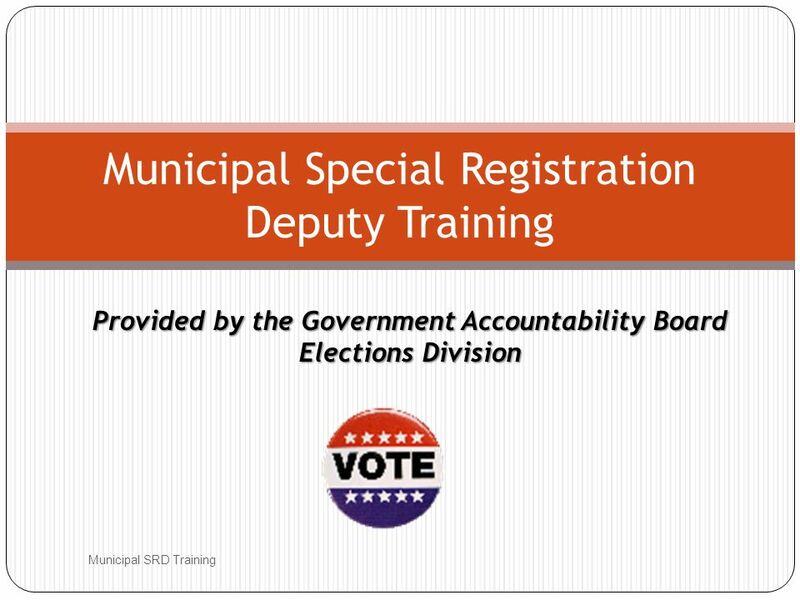 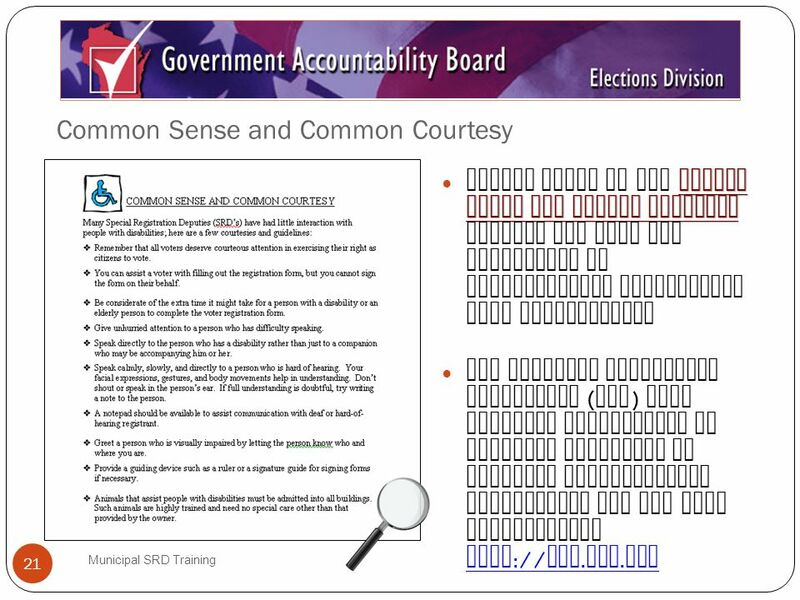 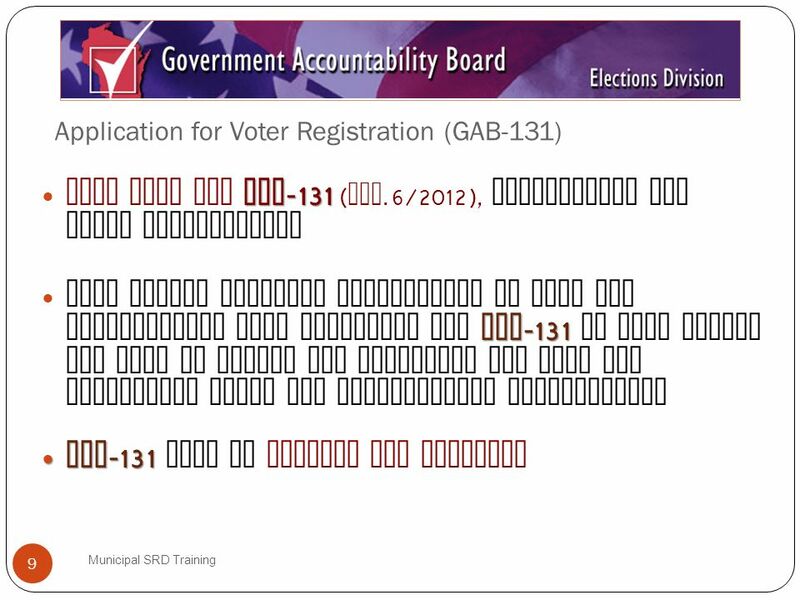 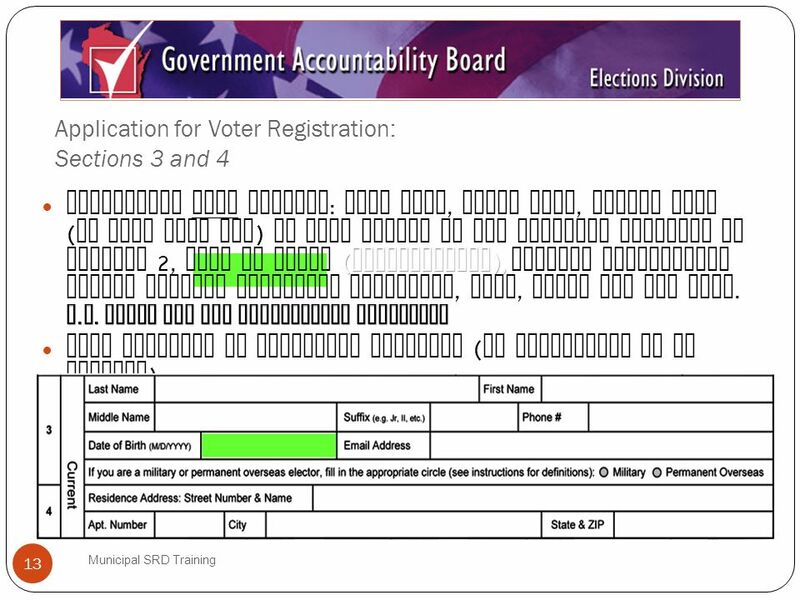 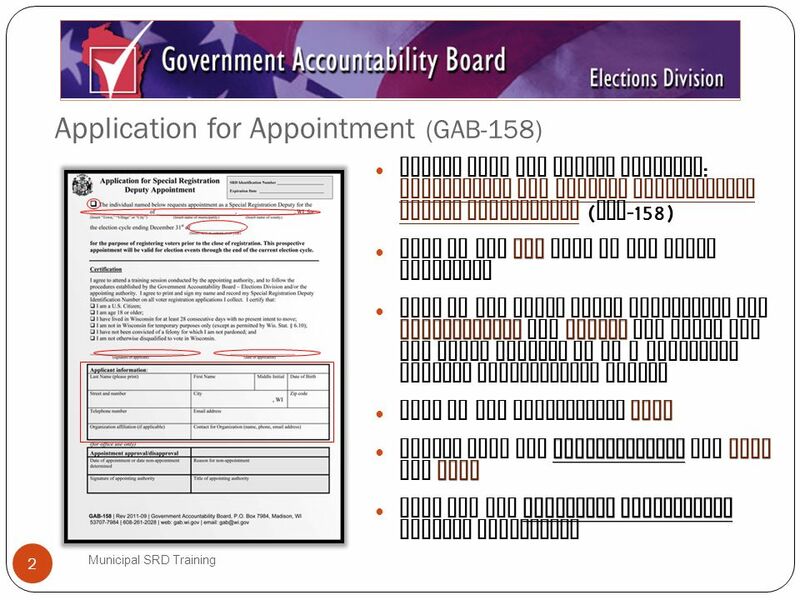 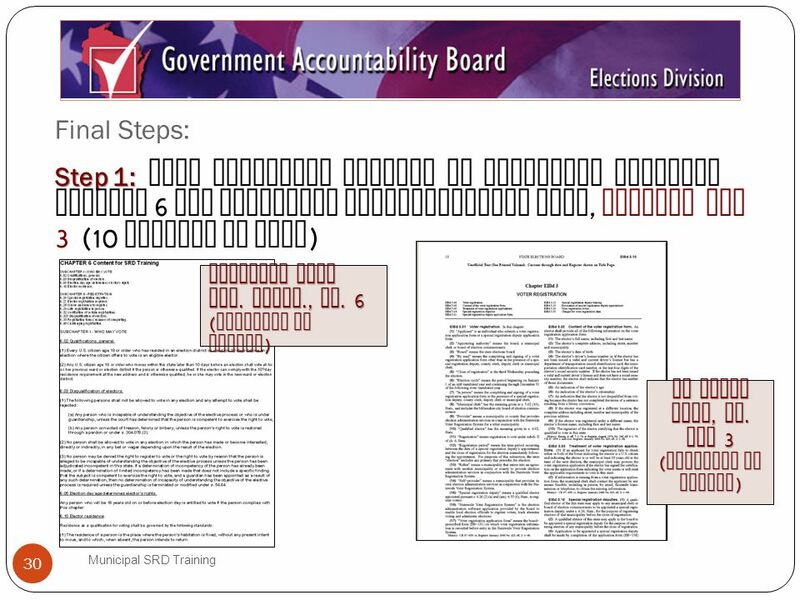 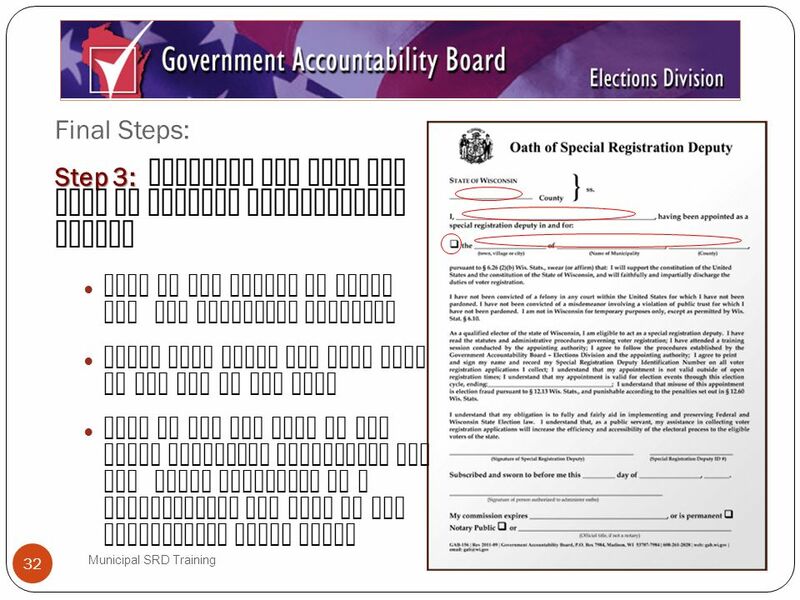 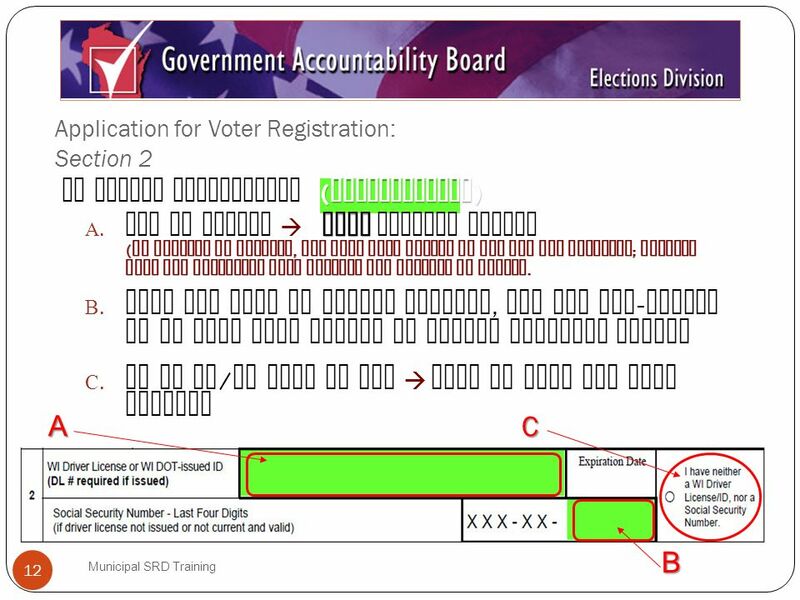 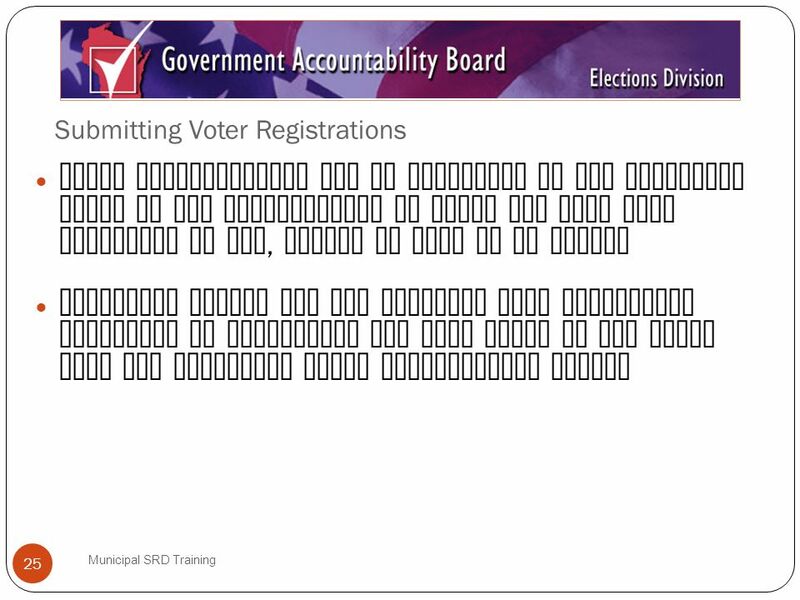 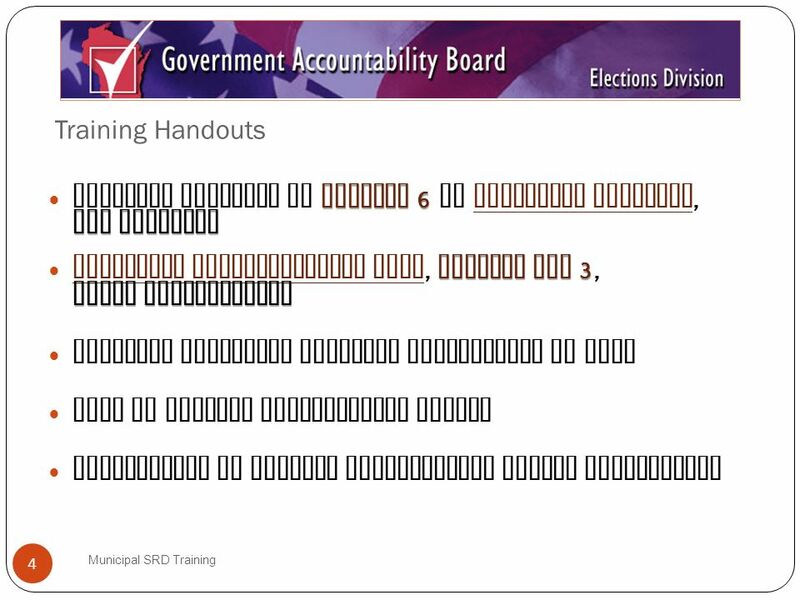 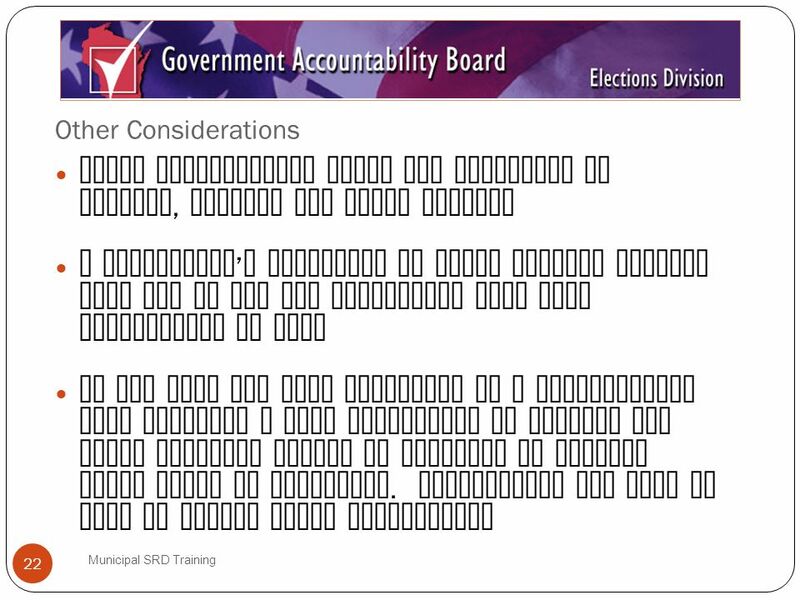 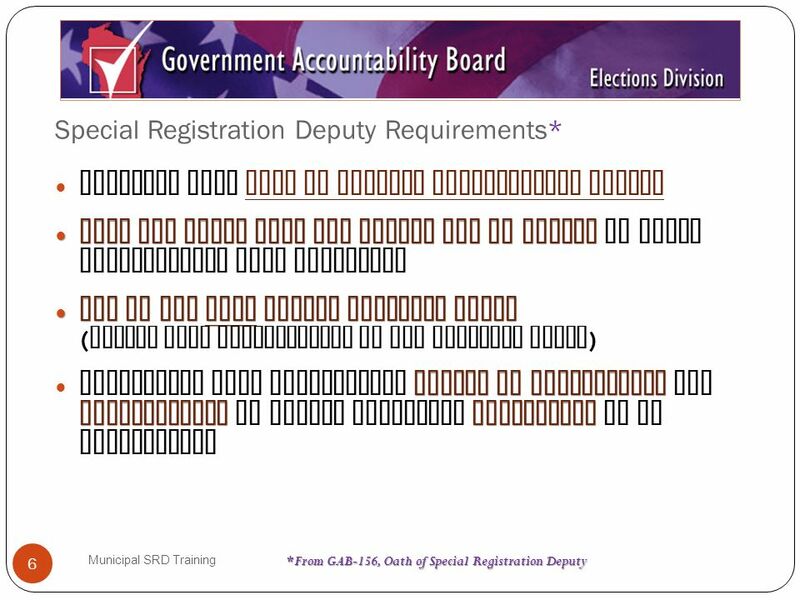 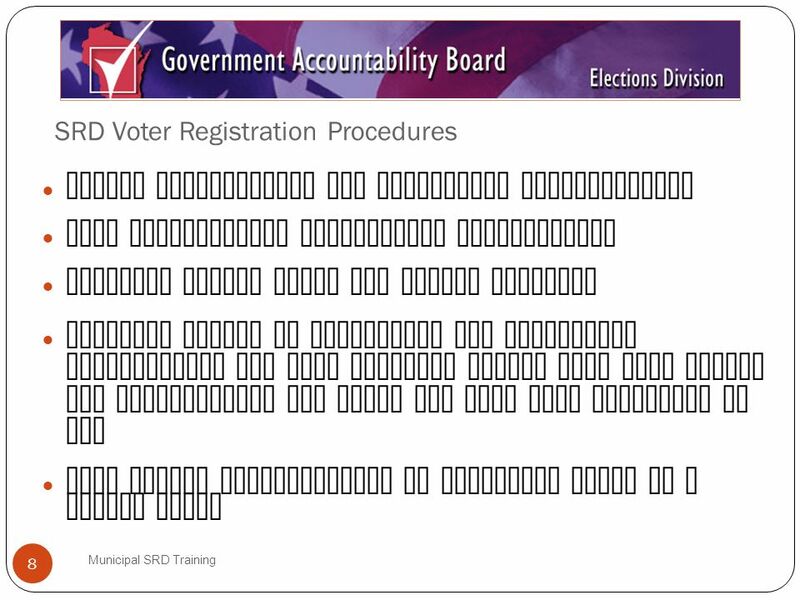 Download ppt "Provided by the Government Accountability Board Elections Division Municipal SRD Training Municipal Special Registration Deputy Training." Instructions for Filling out the Reintegration Opportunity Report Savable PDF Training. 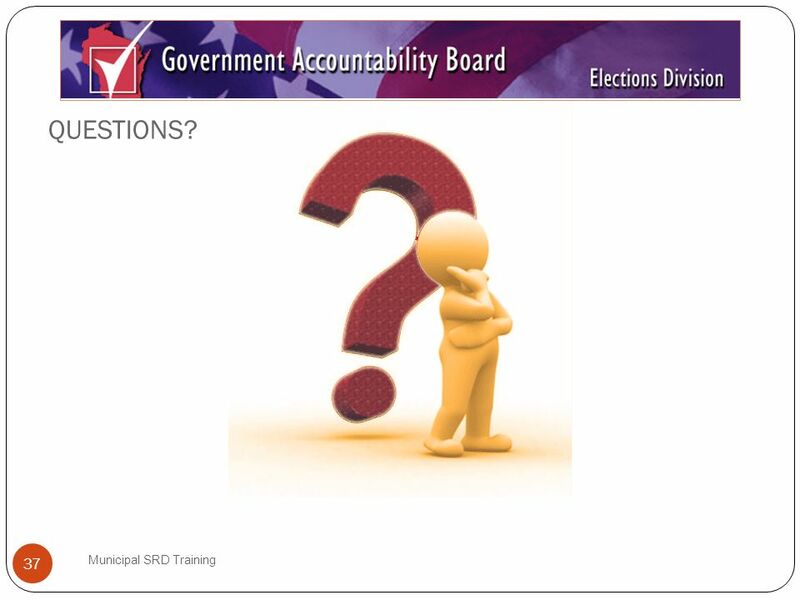 Rowland Unified School District (Slides from ETS) CAHSEE Test Site Coordinator Information. 1 BRState Software Demonstration. 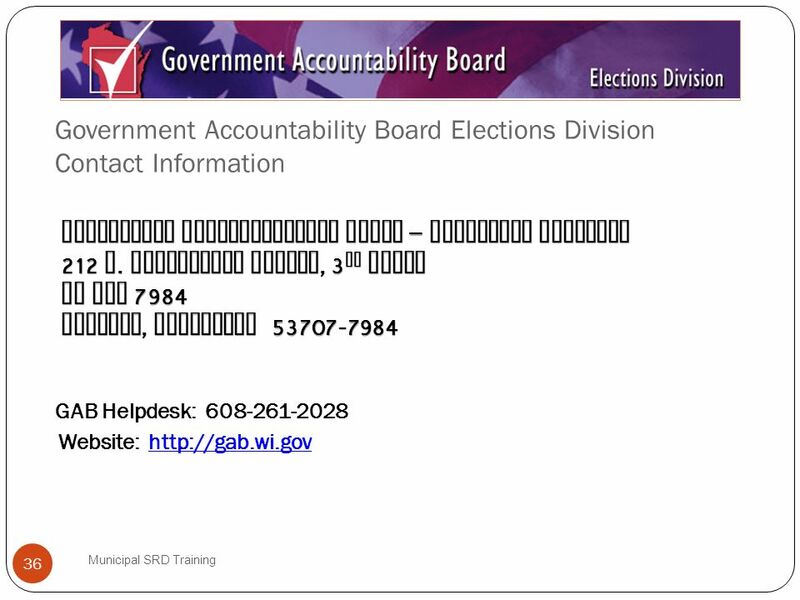 2 After you click on the LDEQ link to download the BRState Software you will get this message.